*F10 Super Concentrate is by far the safest, most effective disinfectant we`ve ever come across - and it`s highly economical as well. *Specialist avian veterinarians, breeders and owners around the world trust F10, here`s why you should too. 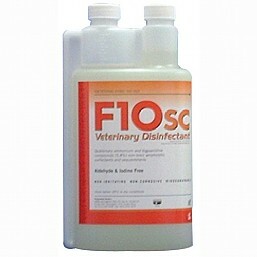 * F10 is extremely effective against avian diseases . * F10 is extremely effective against avian diseases such as Avian Flu, PBFD and Psittacosis, and destroys bacteria, viruses, fungi and spores. Contact times are shorter making application easier. *F10 is non-toxic and biodegradable and will not corrode metals or irritate the eyes or even abraded skin. In fact the latest EU ecological hazard tests assigned it a "zero hazard" rating.